A SpiceJet aircraft had to make an emergency landing at the Indira Gandhi International Airport today after some pieces of tyres were found on the runway just minutes after the Srinagar-bound flight took off from there. The analysis of CVR (Cockpit Voice Recorder) and flight data will take about a fortnight, Civil Aviation Ministry officials today said. According to officials, the CVR even though affected by fire is expected to yield “the desired information”. The DFDAU (Digital Flight Data Acquisition Unit) which is a parallel unit of the DFDR (Digital Flight Data Recorder) and records flight parameter but for shorter duration has also been recovered. The search for the DFDR is still on. With a view to expedite compensation claims of the families of those killed in the Mangalore air crash, Air India has set up centres at Mumbai, Kozhikode, Delhi, Dubai, Chennai and Mangalore. The BJP today said that the first anniversary of UPA-II was marked by “disappointment and betrayal of common man” and that price rise, corruption and surge in Naxal violence were the “achievements” of the government, which could complete one year by “misusing” the CBI. The Sikkim police is on the lookout for suspects in the killing of All India Gorkha League chief, Madan Tamang, as they could have fled Darjeeling and entered the state, senior police officials said today. The West Bengal police has sent a list of names of suspects in Friday's killing, they said. Further details like physical descriptions and photographs have been sought, the officials said. Uncertainty prevails over the proposed tri-partite talks and the political-level discussions on the Gorkhaland issue in the wake of the murder of ABGL president Madan Tamang vis-à-vis the ongoing public protests in the hills. The verdict on the appeals filed by convicted former Haryana DGP SPS Rathore against his conviction and counter appeal by the CBI and Ruchika’s family for enhancing Rathore’s sentence, is expected tomorrow with the court of Additional District and Sessions Judge, Gurbir Singh, likely to pronounce the same. An anti-Sikh riots case involving Congress leader Sajjan Kumar, from which the judge hearing the case recused himself during the last hearing, took a new turn today when the district judge asked the judge to specify the reasons behind his recusal and send them in a sealed cover. The biennial polls to the five Rajya Sabha seats falling vacant from Bihar are likely to augur well for senior Dalit leader Ram Vilas Paswan and his Lok Janshakti Party (LJP). Both Paswan and his partymen had been anxiously waiting for this election to ensure the former’s entry into Parliament. The Confederation of Newspapers and News Agencies Employees Organisations today said it would launch a countrywide agitation if the government failed to extend the tenure of the wage boards of journalists and non-journalists within the next three days. The environmentalists are up in arms against Andhra Pradesh government’s plan to build a memorial for former Chief Minister late YS Rajasekhar Reddy in the middle of Nallamala forests as the area is part of a protected wildlife sanctuary. The Indian Army's 6th Assam Regiment faces a major embarrassment after a consignment of high-end bullets ferried by its personnel were robbed by suspected Naxalites in what looks like a meticulously planned operation. With birds posing a major hazard to flight safety, the IAF is procuring micro-light aircraft to survey the area in the vicinity of airfields for bird activity before and during flight operations, especially at stations housing fighter squadrons. Besides, the micro-lights, spread across at various airbases, would also be used for adventure activities. Rock Capital of the East, Shillong, swayed to the tunes of legendry American musician Bob Dylan on his 69th birth anniversary today. And, leading the celebrations was Shillong’s very own Bob Dylan, 63-year-old rock musician Lou Majaw. The Railway Ministry has announced an award of Rs 25,000 to a trackman who arranged a vehicle to transport an injured survivor of the Mangalore air crash that claimed 158 lives. Syed Bilal Ahamed had noticed the injured survivor while he was proceeding to his 'gang toolbox' at Mangalore on Saturday. In a potentially significant breakthrough in the February 13 German Bakery terror blast in Pune, an Indian Mujahideen (IM) operative, Abdul Samad Bhatkal, was arrested from Mangalore airport on Monday, police said. Bhatkal is believed to have planted the bomb that exploded it, killing 17 persons. In one cruel swipe, fate took away all that 13-year-old Rauhan loved the most - his parents and two younger siblings who died in the Air India Express plane crash here on Saturday. Two militants belonging to the banned National Democratic Front of Bodoland (NDFB) were shot dead by a joint team of the Army and the police near Assam-Arunachal Pradesh boundary in Sonitpur district of Assam. The 26/11 special court has come down heavily on the prosecution and investigating agency for submitting “doubtful” and “fragile” evidence against accused Faheem Ansari and Sabauddin Ahmed that led to their acquittal in the Mumbai terror attack case. India and the USA today firmed up the substantive agenda, including bilateral and regional issues, for the first Strategic Dialogue to be held in Washington on June 3. The agenda was fine-tuned at a meeting between Foreign Secretary Nirupama Rao and US Under Secretary of State for Political Affairs William Burns here. The plane landed safely and all passengers and crew members were reported to be safe. Sources say the pilots of another aircraft, which landed soon after SG-224 took off, noticed some pieces of tyres on the runway and they informed the ATC. The DIAL authorities later confirmed the Srinagar-bound SpiceJet flight had to come back due to a suspected tyre-burst, as informed by the ATC. An emergency was declared at the airport at 1.18 pm. By that time, the Boeing 737-800 had been airborne for about 15 minutes and travelled around 100 miles. In an SMS to The Tribune, Gopal Krishna, a passenger, said the flight took off at 12.20 pm for Srinagar. He said there were some “abnormal vibrations”. “Everybody was a bit scared, but kept hoping for the best. On touchdown, we all celebrated,” he said. The aircraft landed at 2.36 pm on runway number 11 with 195 passengers, including crew, on board. All passengers were shifted to another aircraft for journey to Srinagar and the emergency was called off at 3.35 pm. Before landing, the plane hovered over Delhi for around an hour to burn as much fuel as possible and reduce the weight of the aircraft. Fire brigades, ambulances, engineering teams and other services remained positioned as the aircraft first made the low pass over the runway for airport engineers to assess any visible damage. They noticed a burst-tyre on the right side of the aircraft and asked the pilots to try a smooth sail landing. The aircraft was ordered to return to Delhi because emergency handling conditions were better here and also because it was a part of the standard operating procedure.According to a commercial pilot, bursting of tyres generally takes place due to extreme hot weather conditions, like currently prevalent in Delhi. “You always make a precautionary landing at the place from where you have taken off. Normally, a tyre-burst is not a very serious emergency, but with the Mangalore incident still fresh in mind, everyone was apprehensive and did not want to take any chances. A tyre-burst may indicate that there can be a problem with the brake or hydraulic system,” he said. The analysis of CVR (Cockpit Voice Recorder) and flight data will take about a fortnight, Civil Aviation Ministry officials today said. According to officials, the CVR even though affected by fire is expected to yield “the desired information”. The DFDAU (Digital Flight Data Acquisition Unit) which is a parallel unit of the DFDR (Digital Flight Data Recorder) and records flight parameter but for shorter duration has also been recovered. The search for the DFDR is still on. Preliminary replay of ATC tapes and their detailed analysis has been completed and so is the investigation of navigational, aerodrome and runway facilities existing at the time of accident. The necessary records pertaining to the aircraft and air crew such as engineering, operations, training, ATC, fire fighting and allied services have been taken over for a detailed analysis. Apparently, the Serbian pilot of the Air India jet which crashed on Saturday tried to take off the plane again before the crash. The throttle of the plane, found by search workers on the site of the crash, is on forward position, meaning the pilot was trying to take off before the crash. Pilots, however, say the decision has to be taken much before the touchdown. “This year was of the year of betrayal of aam adami, year of massive corruption in government and administration, year of inhuman atrocities by Naxalites,” Leader of Opposition in Lok Sabha Sushma Swaraj said. “I can’t understand what are the celebrations for. Are they celebrating the death of people in Naxal violence or celebrating 2G Spectrum scam? What are you celebrating?” she said. 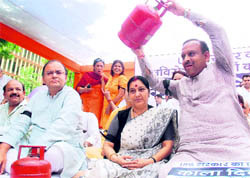 The first year of the UPA-II should be termed as a “black year”, Swaraj said at a demonstration organised here by the Delhi unit of BJP to protest the government’s policy on price rise, terrorism, Naxalism and unemployment. She alleged that the UPA-II has committed the “biggest betrayal” of the common man, though votes were sought in the name of ‘aam aadmi’ before the elections. “What have they (UPA) done in one year -- harassed aam adami with price rise, made some of its ministers rich and gave Naxal menace to the security forces. This is the achievement of this government,” she charged, describing UPA as “Unlimited Problems Alliance”. The Sikkim police is on the lookout for suspects in the killing of All India Gorkha League chief, Madan Tamang, as they could have fled Darjeeling and entered the state, senior police officials said today. The West Bengal police has sent a list of names of suspects in Friday's killing, they said. Further details like physical descriptions and photographs have been sought, the officials said. The police was informed that some injured Gorkha Janmukti Morcha (GJM) activists could have been brought to neighbouring Sikkim for treatment, but they ascertained that no one came here, according to the officials. 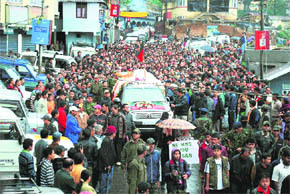 Tamang was cremated today with full state honours at his village in Mekhla, about 80 km from the hill town, while hundreds of Gorkhas of various parties and organisations were in the streets in Darjeeling, Kurseong and Kalimpong protesting against the killing, allegedly by the GJM activists. Chief Minister Buddhadeb Bhattacharjee sent a condolence message to the bereaved family and a wreath was also placed on his behalf on Tamang’s body. Eight prominent GJM central committee members, including Anmal Prasad, Hurkha Bahadur Chhetri, C.R.Rai, Pardin Lama, Amar Lama and Harsh Badahur Chhetri, had tendered their resignations, condemning the GJM’s involvement in the killing. The much-awaited verdict, which was earlier expected on May 20, was postponed for May 25 owing to the lengthy judgment in the case. Earlier, the Additional District and Sessions Judge had on May 11 fixed the verdict for May 20 on three pleas. One plea pertains to the former police chief challenging his six-month imprisonment for “outraging the modesty” of Ruchika Girhotra, who was 14-year-old then and a budding tennis player. The other two pleas pertain to appeals filed by the victim’s family and the CBI seeking enhancement of the sentence awarded to him. It was on December 21, 2009, when the retired IPS officer was convicted for molesting Ruchika Girhotra under Section 354 of the IPC following which he was sentenced to six months’ rigorous imprisonment. Thereafter, Rathore had moved an appeal against the sentence, hearing of which started in February. However, the hearings were adjourned for a long time following the attack on Rathore on February 8 by a Banaras-based youth, Utsav, in front of the District Courts Complex. The day-to-day proceedings of the case held in-camera resumed on May 3 and concluded on May 11. Directing the Sessions Judge VK Goyal to explain the personal reasons, District Judge Bimla Makin said, “State the reasons for transferring the case of missing chargesheet involving senior Congress leader Sajjan Kumar and send it in a sealed cover on May 31.” May 31 is the next date for hearing. Goyal, who was to deliver the order on whether direction could be issued to the police to file a chargesheet in a competent court against Sajjan Kumar, had recused himself from hearing the case on May 22 citing “personal reasons”. “Due to some personal reasons, I do not want to try and adjudicate this matter. Let the file be placed before learned District Judge VIII with a request to transfer the same to some other court of competent jurisdiction,” Goyal had said. His decision took many by surprise because he had been hearing the case all through until the decision to recuse himself. The court was supposed to pronounce the order on an application by the prosecution seeking direction on a chargesheet prepared by the police against Sajjan Kumar, but never submitted before a judicial officer. On April 21, the prosecution said in the court that the chargesheet against the former MP was prepared but never brought before a judge despite having sufficient evidence to do so. The FIR instead was clubbed with other riots cases in which the trials were already going on in the court, Special Public Prosecutor BS Joon had said. The Dalit icon from Bihar had virtually gone into political hibernation ever since his humiliating defeat from his old bastion of Hajipur (SC) during the last Lok Sabha elections at the hands of octogenarian Ram Sundar Das of JDU. Paswan had made it into the Guinness Book of World Records for winning by a record margin from this constituency and maintained his winning streak six times. Paswan’s defeat from Hajipur, even though he was an ally of RJD chief Lalu Prasad, had come as a surprise to party’s rank and file. But even after his defeat, the LJP maintained its alliance with the RJD with the hope that its party chief could make it to the Rajya Sabha only with the help of Lalu Prasad. Now that the polls have been announced on June 17, lobbying is on to ensure Paswan’s entry to the Upper House at any cost. Going by the number of MLAs (voters) belonging to different parties, the ruling NDA should easily win three of the five seats (JDU two seats and BJP one) and the Opposition can at best get the remaining two. As Lalu has already announced Paswan’s candidature for the Rajya Sabha polls on the first seat, the latter’s victory appears certain. But both RJD and LJP leaders seem to be in a fix to decide the candidate for the second seat. Efforts are also on in the ruling camp as well as the Opposition to avoid elections for all five Rajya Sabha seats as they apprehend cross voting by their disgruntled MLAs. However, if elections were held, the RJD-LJP combine would require 12 extra votes to ensure the victory of their second candidate. Both Lalu and Paswan are already negotiating with the left parties -- CPI, CPM and the BSP -- for extra votes. The CPI-ML with its five MLAs would most likely abstain from voting. The confederation members, who staged a rally here demanding the extension, also sought action against Labour Minister Mallikarjun Kharge, who they alleged was taking an anti-labour stand and "favouring the employers". The term of the wage boards expired yesterday. The chairman of the boards, Justice G R Majithia, had sought an extension up to December 31 to submit the recommendations. The Labour Ministry, however, is said to be not keen to grant the extension. “The wage boards have already completed more than 75 per cent of the work. We will launch a countrywide agitation if the government fails to extend the tenure of the boards within three days,” general secretary of the confederation M S Yadav said. He said the confederation would not accept the setting up of a tribunal. The opponents of the project contend that any construction activity inside the core area of the Srisailam Tiger Reserve in Nallamala forests would be detrimental to the cause of big cat’s conservation. Besides, it would also pose threat to thousands of endangered animals, birds, rare medicinal and endemic plants in the ecologically fragile area. The state government has drawn up ambitious plans to construct “Smruthi Vanam”, a grand memorial on 1,412 hectares of land, at Pavuralagutta where the former CM and four others died when their helicopter crashed in the forest on September 2 last year. “The project will amount to violation of the provisions of WildLife Act and Supreme Court’s directives,” the Forum for Sustainable Development (FSD), an NGO working in the area of environment protection, said in a letter to the Union Minister of State for Environment and Forests Jairam Ramesh. overall detriment of the need to protect the tiger reserve,” the FSD member and a retired IAS officer EAS Sarma said. He urged the Union Minister not to accord permission for the project in the overall interests of the environment. The chopper crash site is located in a notified tiger sanctuary called Gundla Brahmeswara Wildlife Sanctuary. All construction activity is banned in a tiger reserve unless permitted by the Central government and the Central Board for Wildlife. “Ironically, the proposed memorial will go against the critical tiger habitat proposed by YSR himself in October. The critical tiger habitat was to be created by merging the tiger habitats of Nagarjunasagar-Srisailam Tiger Reserve with the entire Gundla Brahmeswaram Wildlife Sanctuary,” said M Veda Kumar, president of Forum for Better Hyderabad, another ‘green’ NGO. The sanctuary is home to the highly protected tigers. The hillock where the twin-engine Bell 430 helicopter, carrying the former CM crashed is at Pavuralagutta, about 30 km from Atmakur town in Kurnool district. Tigers, panthers, sloth bears, wild dogs, hyenas, jungle cats, bonnet monkeys, marsh crocodiles, pangolin, sambar, chowsinga, chinkara and mouse deer are some of the species found here. If a memorial is to be erected, then roads will have to be laid and basic facilities such as lighting arrangements and drinking water will have to be provided. Such construction activities are not permitted in reserve forest areas as per the Wild Life Conservation Act of 1972, the environmentalists pointed out. Spread across 9,500 sq km, Nallamala forest is home to thousands of endangered animals and birds. The development activity of the proposed memorial, together with approach roads, paths, infrastructure, vehicular traffic and large number of pilgrims will disturb the ecological balance and endanger thousands of animals, birds, and plants, they said. The Rs 4 crore memorial is proposed to have a four km trekking track to the accident site on a hillock, a peacock breeding centre and an elephant sanctuary. “We request you to set aside the compulsions that may arise from the narrow point of view of the Congress party and ensure that no environmental clearance is accorded by your Ministry for this highly objectionable project,” Sarma said in his letter. The consignment comprising 75 bullets and other devices used to carry out explosions were being escorted by Deputy Superintendent Madhuram Nath of the 6th Assam Regiment and seven jawans from Guwahati to Pune. The consignment was stored in the luggage compartment of the Guwahati Express while the army personnel rested in adjoining compartments. The bullets and other equipment were to be tested at the Pune ordnance factory, according to a complaint filed with the Government Railway Police here. Only the trunks containing the bullets and some electrical devices used to engineer blasts were taken away while the rest of the cargo was left intact, indicating that the thieves were acting on inside information. In all, three trunks were stolen. Senior Inspector Dilip Gore of the Government Railway Police said the loss was noted when the train arrived at the Lokmanya Tilak Terminus on Friday night. The army personnel who went in to the luggage compartment to check on the consignment reported the loss, Gore said. Explaining the modus operandi of the operation, Gore said the thieves entered the train after cutting open a panel on the roof of an adjoining compartment. They then cut open the wall of the luggage compartment and made away with the consignment. "The thieves seem to be experts who knew how to cut open metal in a short time," Gore said. schedule, according to railway sources. The stolen cartridges is meant for use in the INSAS rifles of the Army which is also a favourite weapon of the Naxalites. About 10 per cent of IAF accidents are attributed to bird hits and fighters are particularly vulnerable to this during take-off and landing. A bird ingested by an engine often results in a flameout and recovery at low altitudes is difficult. Growing habitations around airfields and consequential garbage littering attract birds, an issue regularly taken up by the IAF with local civilian authorities. Mirco-lights, circuiting around the airfield would not only be used to spot bird flocks and pass on the requisite information to air traffic control, but would also be used to recce the ground below for objects that might attract birds. Over the past years, the IAF has adopted several measures to check bird activity around airfields. These include chopping down trees and vegetation and fixing brightly coloured reflective streamers near the runway to scare away birds. A number of fatal air crashes have been attributed to bird hits. There have also been instances of aircraft suffering bird hits while flying at high altitudes. Last year, an IL-76 heavylift freighter flying at 22,000 feet between Leh and Chandigarh was hit by a bird, prompting it to go in for DNA testing to find out which kind of bird flies so high and in that region. Civilian aircraft flying out of regular airports are not immune to bird-hits too. There have been instances where pilots of scheduled airlines have reported engine or airframe damage due to bird hits. Apart from the IAF, the National Cadet Corps is procuring as many as 110 micro-lights for its air squadrons to boost adventure training. “Happy birthday Bob Dylan, wherever you are, and god bless you…” Majaw said, as he strummed the chords to ‘My Back Pages’. The Dylan fest is not about fancy pyrotechnics or incessant extravaganza but about the essence of the legendary prophetic singer’s timeless music -- just the way the rock star would have wanted. Rock concerts dedicated to Dylan were organised at Jaiaw’s Pearly Dew School in the afternoon and at the Police Bazaar in the heart of Shillong in the evening with Majaw and sensational band The Bad Monkeys. The celebrations have been a practice in the picturesque hill city for the last 38 years, thanks to Majaw’s gritty endeavours. He was introduced to Dylans’ tunes as a young performer at Kolkata’s Park Street. And there, Majaw developed a lifelong love for Dylan’s brand of music. “It’s because of the great respect I have for Dylan as a lyricist and a poet. His songs have lit up my life and given it a lot of meaning,” said Majaw. Dylan, born Robert Allen Zimmerman in Duluth, Minnesota, on May 24, 1941, is a legend whose profound lyrics and songs set a new trend in American music spanning nearly five decades. Among other Dylan fans who flocked Shillong today was Jasper Dawson from Kanyakumari. “I should thank Dylan for bringing me to Shillong to celebrate his 69th birthday,” Dawson said, while strumming ‘Tambourine Man’. Dalitri Kharmaior, another fan, rocked the concert with ‘Knocking on Heaven’s Door’. Fans from Mumbai, Delhi, Goa, Chennai, Bangalore, Kolkata, Guwahati, parts of the North-East attended the fest. Ahamed informed his colleagues and arranged a vehicle for the injured to reach hospital, with the assistance of two local people, a railway release said here today. However, top Anti-Terrorist Squad (ATS), police and Home Ministry sources in Maharashtra declined to comment on the development till late in the evening. Samad (23), a resident of Bhatkal town of North Kanara district of Karnataka, is said to be a close associate of IM founders Riyaz Bhatkal and Iqbal Bhatkal, police sources said here. Following a tip-off, Samad was nabbed by the Maharashtra ATS shortly after he landed from a Dubai flight at Bajpe International Airport in the morning, they said. He is now lodged at the Bajpe police station in Mangalore and is likely to be brought to Mumbai soon. Rauhan, the only surviving member of his family, flew in from Dubai yesterday with his uncle to trace the bodies of his father, mother, five-year-old brother and three-and-a-half- year-old sister at the Government Wenlock hospital mortuary here. Mohamed Ismail, his uncle, identified Rauhan's mother from among the badly charred remains. A fatigued Rauhan, however, opted not to enter the mortuary. The DNA experts last evening took Rauhan's blood samples to establish the identities of his father and siblings as no unclaimed bodies matched the specifications given by Rauhan, his uncle said at the hospital last night. Ironically, Rauhan's family was rushing here to attend the funeral of his grandmother, who died on May 21. The security forces recovered two pistols, one grenade, two mobile handsets, and two bicycles from the slain militants. The forces acted on a tip-off that four NDFB militants were coming to the area for extortion. An Army spokesman Colonel Rajesh Kalia informed that operation against the NDFB militants has been geared up along Assam-Arunachal Pradesh boundary following May 12 abduction of a senior Indian Forest Service officer Vilas Bardekar from a village near Eagle Nest Wildlife Sanctuary in West Kameng district of Arunachal Pradesh. The NDFB’s hand has been suspected in the abduction. The forest official has remained untraced till date despite the security forces launching a search operation in the area. “The evidence of the only prosecution witness is unreliable. The investigating agency has failed to provide quality evidence against the duo,” the 1600-page judgment, a copy of which is with the PTI, said. The court had acquitted them on May 3 by giving them the benefit of doubt. Witness Nooruddin Shaikh had deposed in court that he and another person, Bharat Thakur, had travelled to Nepal in January 2008 where he saw Ansari’s hand over maps of Mumbai target locations to Sabauddin at a Kathmandu guesthouse. According to the prosecution, these maps were used by the Pakistani terrorists, including Ajmal Kasab, and one such map was found in the trouser pocket of slain terrorist Abu Ismail. “Shaikh has not produced any documentary evidence of his travel and stay at Nepal. The witness has admitted that a record is maintained at Sonavali border with regard to entry of persons into Nepal. He was not able to produce any entry slip. The investigating agency has not made any attempt to collect this evidence and not even tried to verify if Shaikh had visited Nepal,” the court observed. “The prosecution has also not examined Bharat Thakur to corroborate Shaikh’s evidence. The prosecution’s explanation that Thakur is not traceable is feeble and does not appeal to the court's reason,” the judgment states, adding that Thakur was one of the most important witnesses to prove the prosecution’s case against Faheem and Sabauddin. External Affairs Minister SM Krishna and US Secretary of State Hillary Clinton will hold the Strategic Dialogue, marking a new chapter in the rapidly expanding and deepening ties. Rao and Burns reviewed the bilateral agenda and, specifically, the progress made in the India-US Strategic Dialogue announced on July 20, last year during Clinton's visit here, External Affairs Ministry said in a statement tonight. "The substantive issues relating to the forthcoming visit of the External Affairs Minister to the USA from June 2-3 for the inaugural meeting of the India-US Strategic Dialogue in Washington were at the core of their discussions," it said. "Intensified India-US cooperation in the five focus areas of strategic cooperation, energy and climate change, education and development, economic trade and agriculture constituted their main agenda," the statement said.